Whatever your application needs, Innotec of Wisconsin, Inc., works to supply the right tape for that specialty application. APPROACH IS SIMPLE, YET POWERFUL. 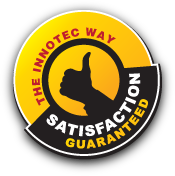 Whatever your application needs, Innotec works to supply the "right" tape for that specialty application. No matter how large or small your requirements, we have the tape to fit your needs. Recognizing the increasing need for diversified tape products, we are committed to the research and acquisition of the highest quality tapes to meet tomorrow's technological demands. In response, numerous industrial brand adhesive tapes are stocked, including the popular 3M brand. Founded by Cheryl Haarsma in 1990, Innotec of Wisconsin, Inc. focused on the distribution of pressure sensitive tape products and added its first slitter machine in 1996 and within six months, a rotary die cutter. Today, Innotec is growing strong and becoming an industry leader in diversified tape products. With consistent, steady growth, the expansion of Innotecs' service division took place in 2004. The expansion focused on creating a one-stop-shop for our customers. Added was a variety of converting services including custom packaging, laminating and sheeting. Of course, we did not stop there. We also added modern slitting and die cutting machines to handle specialty jobs such as foams, films, foils and paper materials.